The Sadhana Retreat is a comprehensive seven-day residential course at Sandipani Vidyaniketan which aims to educate, engage and empower students around the various areas of Sanatan Dharma, Vedic Education and Hinduism. Through the combination of traditional living, intertwined with ancient and modern teaching techniques, attendees will experience the synthesis of balancing spiritual and contemporary life. Inspired by Pujya Bhaishri Rameshbhai Oza, the retreat is developed for individuals who would like to learn about the foundations of Hinduism with like-minded people in a fun, friendly and spiritual environment. 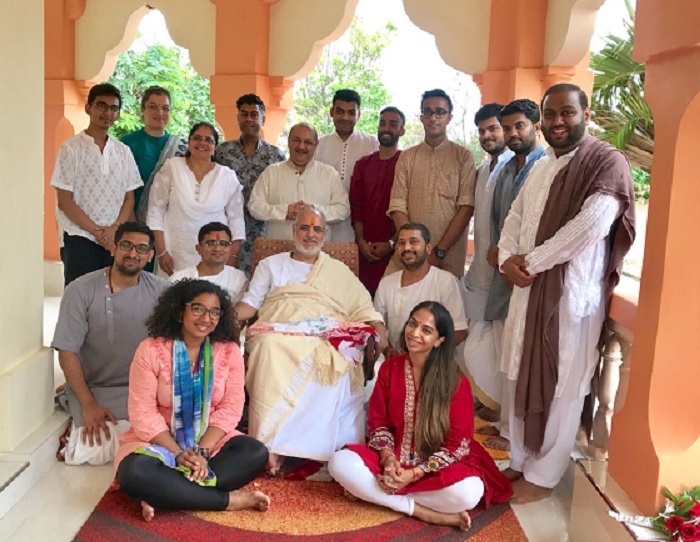 This fantastic opportunity brings together seekers from all over the world with the common goal of learning under the guidance of one of India’s great Vedic institutions. 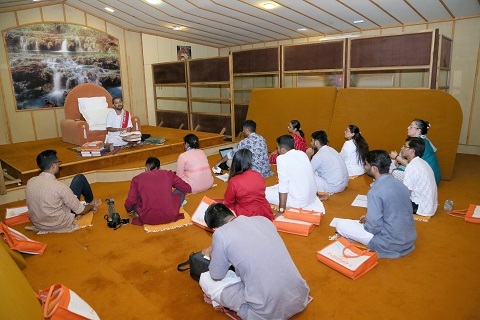 The Sadhana Retreat was first carried out in July 2018 with 15 attendees of various ages from Africa, UK and India and proved to be a great success of Pujya Bhaishri’s vision to continue to keep live the Vedic education and Sanatan Dharma all over the world. The Sadhana curriculum is divided into academic, scriptural and practical aspects of Hinduism. Students will go away knowing the main principles of Hinduism, an in-depth knowledge of the Shrimad Bhagavat and also will have learned Vedic mantras to use in their daily spiritual life. In this practical workshop, you will learn the ancient hymns of the Vedas and how to recite them in order to equip you for practising rituals at home. 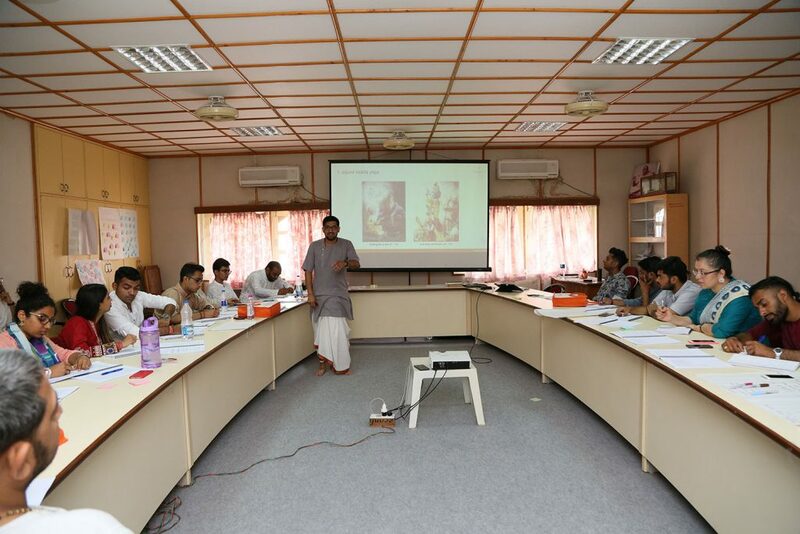 The Vedic workshop module is led by Shri Bharatbhai Shilu, who has achieved Doctorate in Sanskrit from his initial studies at Sandipani Vidyaniketan. The Shrimad Bhagavat class provides an in-depth analysis of one of Hinduism’s greatest scriptures and the importance of spiritual living. The class is led by Shri Shyambhai Thakar who graduated from Sandipani Vidyaniketan and is well known for his Shrimad Bhagavat Kathas. In addition, Pujya Bhaishri is present in many of the classes where you have the opportunity to do satsang, ask any questions and spend time with him. Participants also attend the Shri Hari Mandir Aarati daily, spend time with nature and the clean environment at Sandipani as well as participate in trips to pilgrimages such as Somnath and Dwarka. A graduation ceremony is held on the last day in the presence of Pujya Bhaishri. Sadhana Retreat in 2019 will be held from 7th July to 13th July 2019 at Sandipani Vidyaniketan in Porbandar. The Sadhana Retreat is open to all. However, due to the speed and structure of the course, we recommend individuals over the age of 18 to attend. Prior knowledge of Hinduism is not essential and the course is designed to provide a comprehensive structure for all levels. Each candidate who would like to attend must complete the registration form (see below under Registration). Once the registration deadline has passed, each application will be assessed followed by an email to confirm your attendance. A nominal contribution is required per delegate to cover the costs of the Retreat. Payment Instructions: These will be provided to the successful applicants after Registrations have closed.